Your students will relate to this coming-of-age story filled with difficulties at school and at home. Educators can start their unit on this novel right away with ready-made questions and writing activities. Replace vocabulary words with their synonyms to complete the sentences. Match characters to their descriptions. Evaluate the concept of consequences by brainstorming some other outcomes to the Ramona's behavior. Describe a time when an uncomfortable conversation was necessary in order to 'clear the air'. Record stages of a favorite science experiment in 3 stages. Create a Story Star Maker, detailing the who, what, where, when , why, and how of the story. Aligned to your State Standards and written to Bloom's Taxonomy, additional crossword, word search, comprehension quiz and answer key are also included. About the Novel: Ramona is a typical eight-year-old, but growing up is not easy! For instance, a new fad begins at school where the children whack hard-boiled eggs on their heads before they eat them. 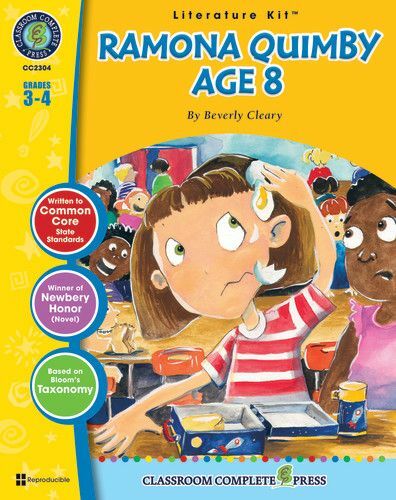 Unluckily for Ramona, she accidentally ends up wearing raw egg on her head – this is not her favorite day! She also must deal with the challenges of being with a four-year-old after school, her older sister's moods, her father quitting his job and studying full time, the family car breaking down, and her family's financial troubles. 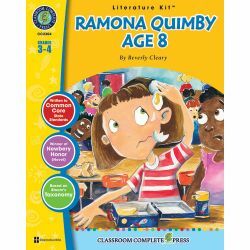 By the end of this entertaining story, Ramona has come to terms with a few things and is just a little bit more mature.